If you walk to the Dom and you see a long queue coming out of one of the side streets of Corso Vittorio Emanuele, then you have to stop straight away and follow the crowd. No, you won’t find a celebrity surrounded by his/her fans, and neither will you find a street artist doing his stunning performance nor a masterpiece of art attracting tourists. You will see a small 3 window shop, full of people, with a lovely smell coming out: Luini. This place has been an institution for the last 3 generations of Milanese people (and it does not even sell Milanese food!) 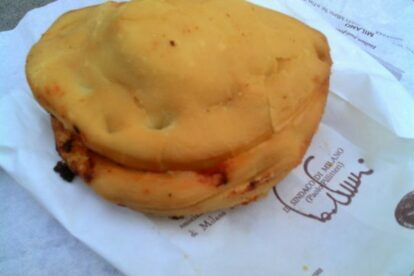 and if you find it, then you absolutely need to stop and try one of its famous panzerotti, a typical street food from Puglia, the region that is in the heel of the Italian peninsula. Traditionally, the panzerotto is made of bread/pizza dough folded in a half moon shape with a mozzarella and tomato filling inside. It can be cooked in the oven or fried, and of course you have to choose between health and taste (I always go for the latter). Luini is the best place in town if you want to taste this delicious specialty and it now offers a variety of fillings, like ham, vegetables or even sweet ingredients (nutella, cream, …).